Reload! Time Crisis Strike, an iPhone version of the lightgun shooter, hits the iPhone's App Store today. Reload! Oh if we could take back all the quarters that people have wasted on spur-of-the-moment Time Crisis sessions while waiting to see a movie, we would be able to get this economy back in business. You won't need any quarters for the latest version of the game, though, just need an itchy index finger, an iPhone or iPod Touch and $5.99. Time Crisis Strike seems like a pretty basic adaptation of the Time Crisis formula for Apple's mobile gaming king. You tap enemies to shoot them with a semi-automatic pistol (sounds like there's only one weapon, which is a shame), and instead of holding down some obscenely loud foot pedal to duck and reload, you tilt the phone. Sounds like that might create the same problem that every other iPhone game with tilt has: when you tilt the damn thing, you can't see the screen anymore. Luckily it looks like you don't have to tilt too much, so that might not be an issue. 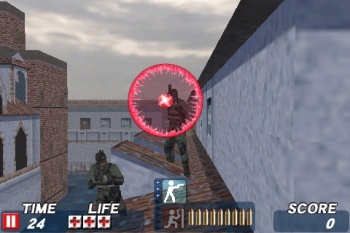 The game has two modes: an Arcade mode where you go through multiple stages "that culminate in a final showdown with the evil Wild Dog," and a mission mode that "puts players' sharpshooting skills to the test." "Time Crisis Strike combines addictive action, stunning graphics, and an intense soundtrack," Scott Rubin, senior vice president of sales and marketing for Namco Networks, said. "For fans of frantic shooting-action, this is a must have in your games collection." Obviously it won't be anything close to the arcade experience - it's not the same without the giant screen and speakers, clacking lightgun with its fake recoil effects, or baffled onlookers with the "people actually play that game?" expressions on their faces. I just hope they've kept the over-the-top announcer who has to shout out every thing you do whenever you do it. Reload! Shotgun! Reload! Machine Gun! Reload!